In Latin, alma mater means "nourishing mother," and is a term used to refer to the university or college from which one graduates. We look forward to the time when you cherish BRCC as your alma mater; our mission is and always has been to nourish and enrich the lives of our students. An alma mater also refers to the song that is written expressly for a university or a college. The alma mater functions as a shared experience for all students of the school, both past and present. 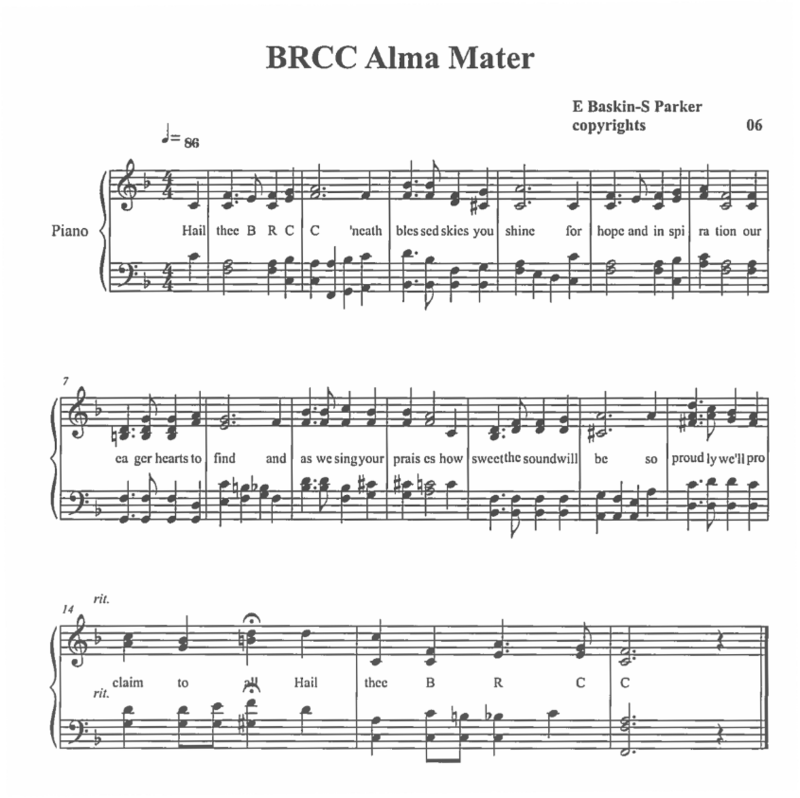 BRCC's Alma Mater was written in 2006. It began as a campus wide contest in the fall of that year under the administration of Dr. Myrtle E. B. Dorsey. Submissions were accepted, and a committee chose the lyrics that were written by then Executive Director of Accounting and Finance Steve Parker; he received an acoustic guitar as a prize. BRCC Music Professor Eric Baskin composed the music, choosing a simple, melodic piece as the accompaniment. We obtained copyrights from the Library of Congress in 2012. That same year, Professor Baskin and then student Ashton Langlois recorded the version we provide here.